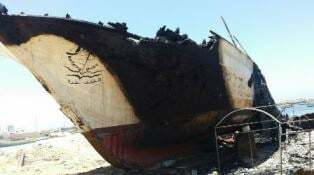 It is with sorrow and outrage that we announce that Gaza’s Ark was totally destroyed by a direct hit from the Israeli Occupation Forces at 2:00 AM local time on Friday, July 11th. It caught fire as result of the hit and was damaged beyond repair. In the context of all the death and destruction caused by Israel, the material damage to our project pales in significance. However, it is now clear that Gaza’s Ark was deliberately targeted by Israel (for the second time). Israel is not worried about its security as it claims, what it is worried about and afraid of are peaceful projects like ours that expose its atrocities. The good news is that no one was killed or injured in this attack as we had decided to pull the guard off the boat two days earlier, for his own safety. We would like to thank everyone who contributed towards the $300,000 raised for Gaza’s Ark, and reassure you that, despite the loss of the boat, your money has not been wasted. We have employed several Palestinians in the refurbishing of the boat over the last year and a half, providing some employment for boat builders, carpenters, plumbers and electricians. With unemployment at over 40% in Gaza, we were glad to offer some employment, if only to a few people. We have also contributed to the efforts of reviving boat building skills in Gaza and passing experience to new generations of craftsmen. Gaza’s Ark also inspired and empowered Palestinians in Gaza – those who worked on it, contributed to it in any way, or supported it. And most important it sent a clear message to Israel: The world is and will continue to stand with the people of Gaza. So, Gaza’s Ark steering committee and the Freedom Flotilla Coalition are currently in intense discussion as to what we will do next. We have many ideas, but on one point we are unanimous: we will continue to challenge the illegal Israeli blockade of Gaza, one way or another. We found it particularly symbolic that, although the boat was badly destroyed, the name and the logo, survived intact. The minimum we all should do now is make our voices heard. Call, or email, our governments, our members of parliament and also call the Israeli embassy or consulate and protest the attack on Gaza, the killings and the destruction, and the targeting of the peaceful Gaza’s Ark, that belongs to all of us. Our motto is “Building Hope” and we will not give up until Gaza is free, and Palestinian rights are fully restored.